Automatic and manual car rental for driving test. It is advisable to take manual driving lessons and test as you then have a choice to driving either manual or automatic car. If you pass your driving test with an automatic car you are only licenced to drive an automatic car. We have manual and automatic cars for hire- rental for driving tests.It is a personal preference. Some people like the control of driving a manual car and some prefer the less stress with automatic. You do have more control on open roads with gears and you typically get better fuel mileage but an automatic car is better in London’s busy, heavy stop-start traffic. 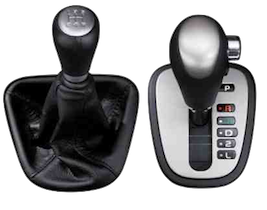 The main difference in operating a car with gears manually vs automatic transmission is that you need to keep changing gears based on the car’s changing speed eg: Higher speeds, higher the gear, lower speeds require lower gears. Constant gear changing requires the coordination of the clutch pedal and the gear stick. When the clutch pedal is depressed the clutch is disengaged from the engine and the power from the engine is separated, this is when you change gears or the car can be brought to a stop without stalling. It’s not depressing the clutch pedal that takes practice. The releasing of the clutch that requires practice. Finding the biting point to ensure a smooth take off without stalling or (kangaroo) jumping and smooth transition between gears once the vehicle is in motion. Learning to control the clutch pedal is one of the main points of driving a manual car. It will take time and patients some Learners may become discouraged after a few unsuccessful trials but after a bit of practice, it gets easier. Once you learned how to use the clutch properly the gear changing become much easier. Why choose automatic driving lessons? Easier and quicker to learn than a manual car. Automatic driving lessons are getting increasingly popular. Here are just a few reasons why! No stalling in an automatic car or rolling back on hills. No clutch and no gears to coordinate. A lot more time to concentrate on controlling the car. Time to develop judgment of speed and steering skills. More time available to concentrate on reading the road ahead. Get to test standard more quickly. Better suited to the stop/start of town and city driving. The small price difference between automatic and manual car driving lessons. Most small cars now offer an automatic option. Pupils have turned to automatic driving lessons to pass in the shortest possible time or because they have had difficulties which have affected their coordination in some way or have restricted movement because of some form of disability.